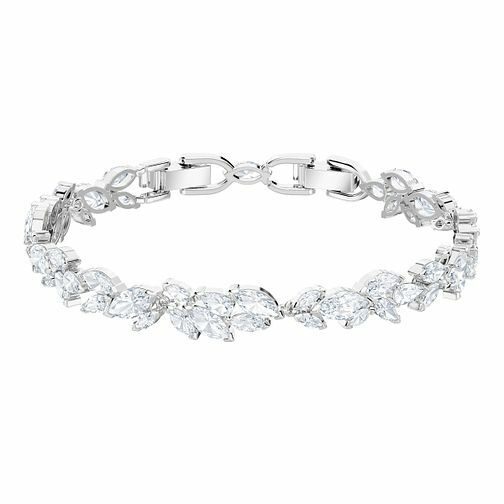 Swarovski presents this beautiful Ladies' Rhodium Plated Louison bracelet. Inspired by fine jewellery and frosty winter leaves, showcases a shimmering swirl of leaf-shaped elements on a rhodium-plated chain. This classic piece exudes refined elegance. Swarovski Ladies' Rhodium Plated Louison Bracelet is rated 5.0 out of 5 by 2. Rated 5 out of 5 by Anonymous from Amazing service and amazing product ! I ordered the product not seeing it in person but I was so impressed and the delivery was super fast it said 5 days came within 2 days so very happy with that ! Rated 5 out of 5 by Anonymous from Swarovski pretty bracelet This is a beautiful bracelet very well made With lots of sparkle the bracelet is adjustable for those with slim wrists, compliments many outfits. Service from Ernest Jones was first class delivered quickly and updated with txts.